I recently changed jobs. I went from being a part-time National Park Ranger and freelancer to a full-time Avian Field Ecologist. 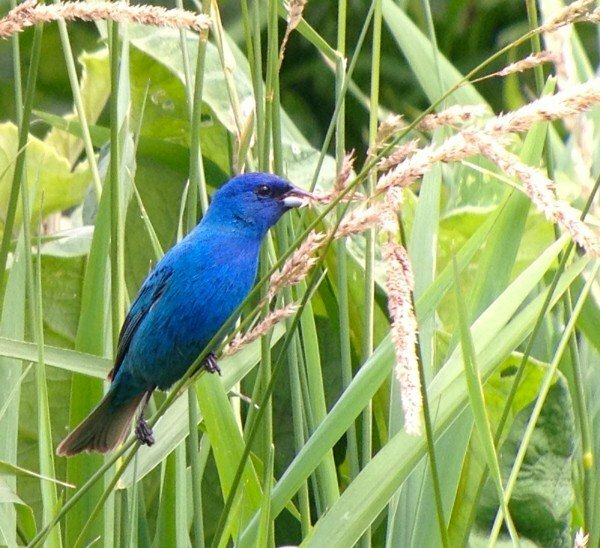 This title basically means I get paid to watch birds (like the above Indigo Bunting I digiscoped with my iPhone and Swarovsksi Scope) before wind farms, solar panels and pipelines go under construction (or sometimes I get to id bird parts found post construction). So how does this happen? Well for one thing, it’s hard to find steady work as an ornithologist. If you have an advanced degree in biology with an emphasis on birds , it doesn’t guarantee that you will always work with birds. You may work in biology, but it could be in any field. Another challenge to bird research is that it is woefully underfunded and relies heavily on citizen science. Think about all the opportunities one can have for volunteering and birds. Because of my flexible freelance schedule the last few years, I’ve had plenty of time to take part in projects that were volunteer but were part of studies. Remember the whole Cornell Ivory-billed Woodpecker search and how you literally had to apply for a volunteer position to pay your own way down to Arkansas for 2 weeks to try and look for that bird? Count me as one of the many who signed up for that. Birding is very citizen science based, birders volunteer for Breeding Bird Atlases, migratory tracking, banding projects–we do it for free because we love it and we often get research experience that those with advanced degrees have paid for through the nose. So, how about you, how do you define ornithologist? Very interesting question, Shaz. Right or wrong, I like to use the term “field ornithology” to describe technical birding, which is perhaps another way to characterize the diligent application of biological, ecological, and taxonomic principles to the observations of birds in their natural habitats. The very detailed and specialized research you’ve conducted on birds in the wild over your birding career has fostered what is no doubt a doctorate level of field knowledge. I wonder what someone was called who studied birds before advanced degrees were attached to the concept? By definition, “A person who studies or practices ornithology”, so is this to assuming that they also have a degree? Study or practice are two separate things and do not necessarily translate into the other — I think there are those who study and those who practice and perhaps one is not the other. For myself, it is someone who is studying birds from a scientific perspective – who may or may not have an advanced degree. I think we run into these problems all the time when it comes to any area of study or practice or even art and qualify a person by having – or not having – a degree in a subject rather than by what they know, which is of course an designation that is created by Universities and those going to advanced institutions to validate or invalidate someone in society. Many educations of yore and the skill developed were based on personal interest and development and not on a degree. Thankfully, many are beginning to understand this concept, and especially the value in learning by apprenticeship. I am slightly sensitive about this because I do believe in formal education a great deal, but I also have a problem with the obnoxious exclusions created by academics solely based on not ONLY your “degree” but “where” the degree was “purchased” from. A degree simply does not translate into personal passion and quality knowledge or creativity. A talented person might go to University to improve their talent, but University does not create a talented, passionate person. Lots of companies are learning this the hard way too! I did obtain a degree, but I didn’t go to University for “birding.” I certainly am interested in Ornithology as an individual and plan to study them in person, instead of going back to college and sitting behind a book for years! And…certain Stanford scientists can be exclusionary and obnoxious all they want, but I love birds and I bet I am going to learn a lot more my way…than their way. However, if a University wants to give me a honorary degree and some point, so someone pays me big money to do what I am doing…I won’t argue. However, in conclusion, as a bird lover I try to separate my interests from both money and formalities. I think it is wonderful you have found a way to love what you do…and do what you love. Bravo! I had an interesting experience last year. I was birding Princeton Institute Woods and ran into a group of graduate students and their professor. They allowed me to join them and were very nice, but it was obvious that their conversation, based on ornithological and botanical research they were doing around the world, was out of my league. To me, that is the difference. Most of us 10,000 Birds readers and writers are naturalists and some, like you Sharon, are lucky enough to make a living at it. An “ornithologist” brings a different perspective to her/his observations, grounded in years learning taxonomy or DNA sequences or physiology. All you have to do is look at the AOU web site and compare it to the ABA web site! Doesn’t mean that there isn’t overlap, ornithologists who enjoy birding and birders who write academic articles. I also think that this separation of self-taught naturalist and academic ornithologist is one of the consequences of the maturing of the study of birds. In the world of dragonflies, the academics seem to be happily co-existing with the naturalists. I think I lean toward using Ninon’s description. If you’re studying birds in a scientific manner and more so for that purpose than as a hobby, you’re an ornithologist. Just because I use eBird doesn’t make me an ornithologist. If I sign on for a study and participate in collection and analysis of data – yeah, I guess I’d call myself an ornithologist without reservation. I don’t think so, perhaps out of false modesty, but I do refer to myself as a general “biologist” simply because my knowledge base is commensurate with at least a B.S. in general Bio. It’s easier to say I’m a biologist and have a technical conversation with someone from the get-go than tell them I’m an “amateur ecologist” and have them waste time feeling me out to see how technical they can get without losing me. As Ninon alludes to above, we may be getting back to the days of the polymath, when a person (it was always a guy in those days) could study and excel in multiple fields largely via self-education. There’s a guy in California by the name of Kerry Knudsen. He’s a world-renowned lichenologist. If you’re not familiar with lichen biology, suffice to say it’s excruciatingly technical. Knudsen has described 25 new species, published about 70 peer-reviewed papers, and curates the Lichens at the UC-Riverside Herbarium as a volunteer. And he’s a construction worker with a high school diploma. No academic degree. He’s had three new species named after him because he carries that much respect in the field. Can we call him a botanist? Conversely, I’ve hired people to work for me that have B.S. degrees in biology with an emphasis on marine biology from a large state university and one of them didn’t know what the word “autotrophic” meant. Is that guy a biologist? Donna brings up another aspect of all this that is dear to me, the marriage of science and hobby in certain fields. I’ve given a lecture on that topic to students in a Zoo and Aquarium Science class at Michigan State for a few years now. Ornithology has led the field in accepting and legitimizing citizen science. The Christmas Bird Counts have been going on for a century. While I’m not much of an Odonate biologist, from what Donna says it’s a good relationship there too. There are rumblings of that in marine biology where aquarium hobbyists are leading the way in discoveries about coral health and nutrition. This is invaluable information for those scientists looking into captive recovery and restoration programs for reefs. There’s been a disconnect there, but it’s slowly coming down. As with collection of bird data, the scientists see that the hobbyists have the time and disposable income to gather immense quantities of data. They may be largely anecdotal, but they’re data nonetheless, and at the very least provide a framework from which to craft a scientific study. Wow…I’m talking too much…Sharon hit a subject I’m more than a little bit passionate about! I like what Kirby said and don’t have much to add, but I think this is a conundrum that is dealt with in astronomy, so some degree, too. Amateur astronomy is a big deal, and more eyes in the skies means more opportunities to see cool things, much like birding! When I think of fields where hobby and science intertwine in an almost symbiotic way, ornithology and astronomy are always the first two that come to mind. Part of it as accessibility, there are very few hobby particle physicists or pediatric oncologists for obvious reasons having to do with specialized equipment and training, but a big part of it is that long culture of scientific inquiry, in at least data collection, that Sharon mentions. In the end, I think it’s a semantic distinction rather than an actual one, and there’s nothing wrong with calling a bird science professional or even a very keen amateur, an “ornithologist” even if there’s no advanced degree. The point your getting across is that this is someone who is serious about birds. ‘Nuff said, really. I don’t think having a degree or not has anything to do with being an ornithologist. My definition of an ornithologist is someone who studies birds to gain scientific knowledge about them. Having a degree doesn’t mean you’re actually doing that and not having one doesn’t mean you aren’t doing it. Hi Sharon, in my humble opinion, being an ornithologist or not has nothing to do with a university degree but about one’s approach to birds. An ornithologist is a scientists. Scientists ask “how” and “why” questions, with species, assemblages and communities playing a context-relevant role in one of those questions. In theory, someone could be an excellent ornithologist and have no idea how to tell apart a vulture from an eagle. If one wanted to know the answer to a what, where or when question, then one is quite often served best by a birder and not an ornithologist. Good birders will have a wide and deep understanding about bird identification, distribution and habits. An ornithologist does not necessarily need any of this. Having said all that, many ornithologists are also hobby birdwatchers or more serious birders, which makes the split even more difficult. Some of the greatest ornithologists have not held degrees in science, but contributed massively to our ornithological understanding because they were asking the right questions. A university degree in ornithology should – in my opinion – be teaching students how to be asking the right questions, and go about finding the answers; and not necessarily teaching “stuff” to be memorized. Al’s ecologist was a scientist asking questions, looking for answers, in a particular context that happened to involve birds. Dale sums it up nicely. Before the terms “birding” and “birder” became popular in Germany, a person watching birds was called an “Orni”, and would usually have called himself a “Hobby-Orni” unless he had a university degree in biology / zoology and was professionally working on birds. Chasing rarities was not as popular or rather dominant as it is now, people mostly birded their own local patch doing breeding bird or winter bird surveys, systematic migration counts etc, so there was a more systematic and scientific approach. The entire birding scene in Germany has now shifted significantly and very much resembles British or American activities. The term “Orni” had practically disappeared. Someone who is paid to research bird biology and publishes their results in peer-reviewed literature.